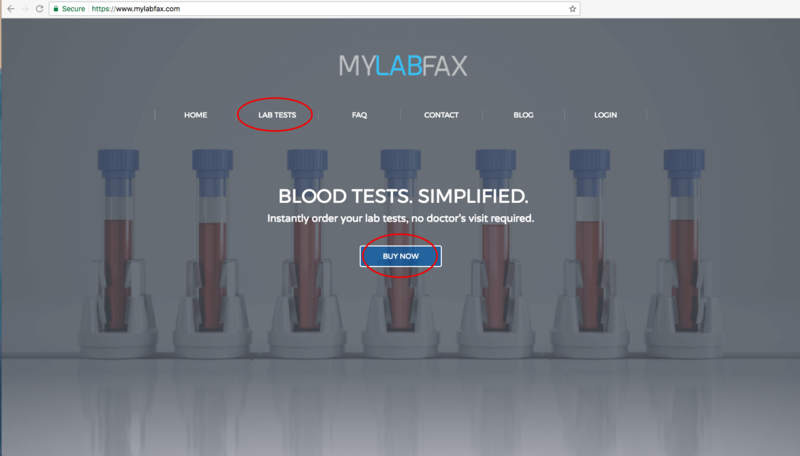 Lately, I’ve received requests to explain how a person would order lab tests online.As with any new service, understanding the process can be a bit tricky at first, so today I’ll take you step by step through ordering blood work via MYLABFAX. At the center of our homepage, you’ll see the blue “Buy Now” button. Click it, and you'll be taken to the “Category” page where you can choose from pre-selected groups or “panels” of lab tests.The various lab tests featured on this page include general wellness tests, hormone, and STD testing. We even have options for lab tests based by age and gender. 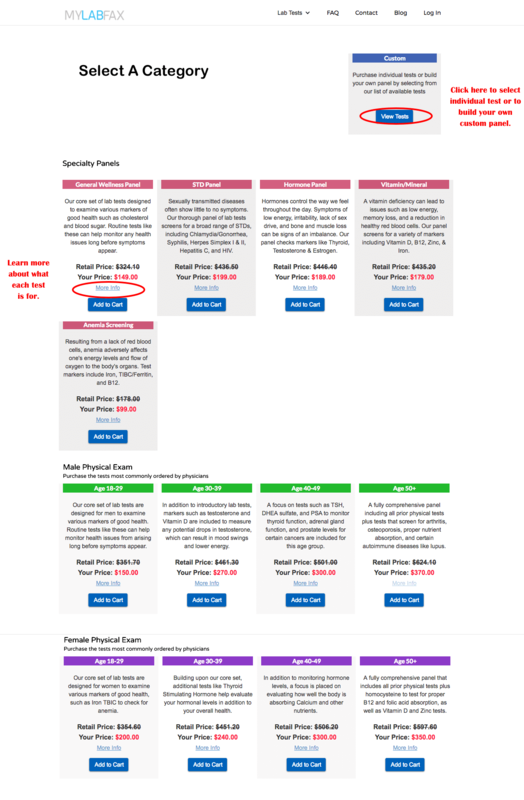 Once you've decided on a panel, if you’d like to know more about what you’re purchasing, click the “More Info” link, just above the “Add to Cart” button located at the bottom of the test panel. You’ll be taken to a page that explains exactly what you’re purchasing and why you need it. 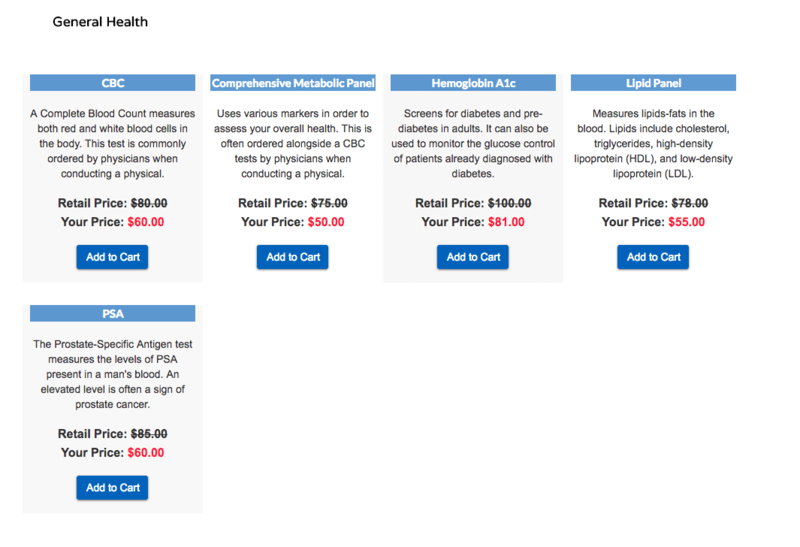 If you’d prefer to create a custom set of lab tests, click the “Custom” button at the top right of the page. You’ll be taken to our Custom Lab Tests page, where we offer all our tests individually. You can pick and choose as you please. 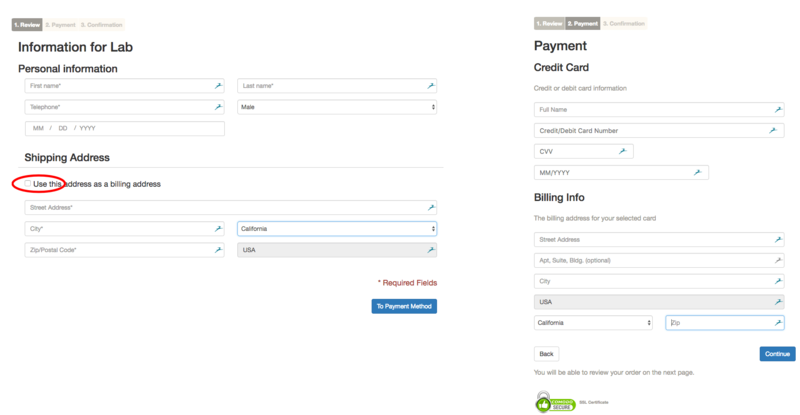 The prices you see on the Custom Test page each include the $30 laboratory fee. If you only buy one test, then the price you see is the price you pay. However, if you purchase more than one test, the $30 fee will be removed from each additional purchase. After clicking Checkout, the next page you’ll see is the Account Registration page. Here you’ll fill out your first/last name, email, and create a password so you can securely access your lab slip and lab results. If you’re a returning customer, click the “Sign in” link under “Create Account” to enter your email and password. Once you've set up your account , you’ll be taken to a page to fill out your personal information, along with your home/shipping address. If your billing address is the same as your shipping address, be sure to check the box to save some time. 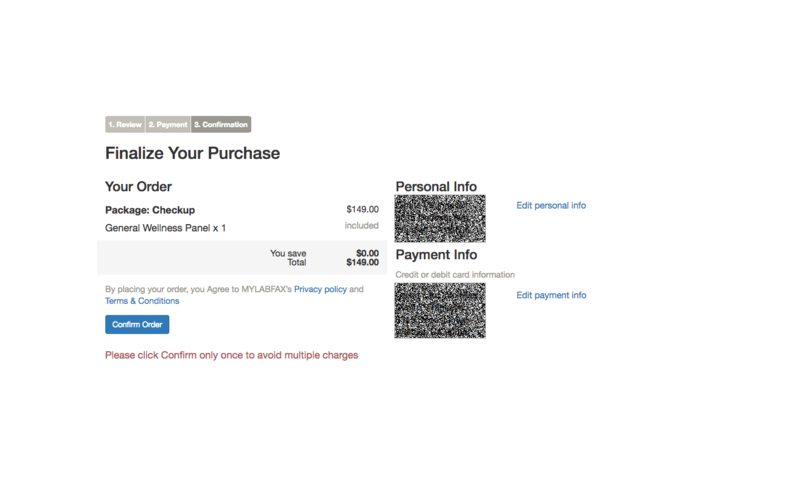 Checking the box on the Shipping will automatically fill in the Billing info on the following page. Finally, you’ll review your order one last time before submitting it. Normally, you’ll be able to see your personal information on the right side of the screen, but in this example mine has been blurred. Click “Confirm Order” to finalize your purchase. Once submitted, you'll see a "redirect" page before being automatically sent to your dashboard. After finalizing your purchase, you’ll be taken to your private dashboard where you’ll have access to your PDF laboratory slip. 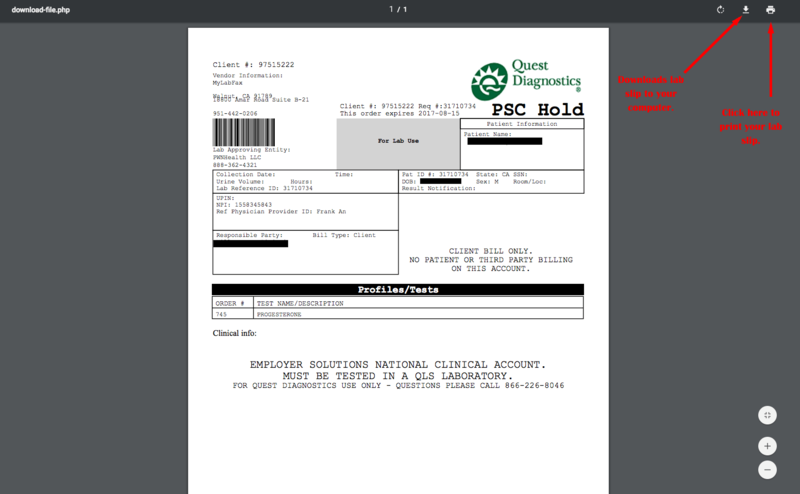 It is important that you print and present this slip to Quest Diagnostics, otherwise they will not draw your blood. This is also the same dashboard you’ll log into to get your results once they’re ready, which we’ll discuss further below. To find your nearest Quest Diagnostics lab, click the “Lab Locator” tab, enter your zip code, and click “Find Your Nearest Lab”. You’ll be given the 10 closest locations. 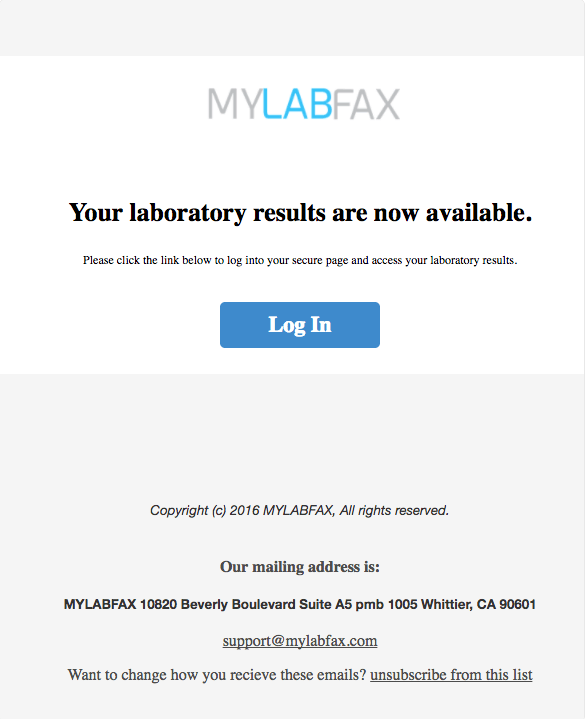 This is where you'll download your PDF and locate your closest laboratory. 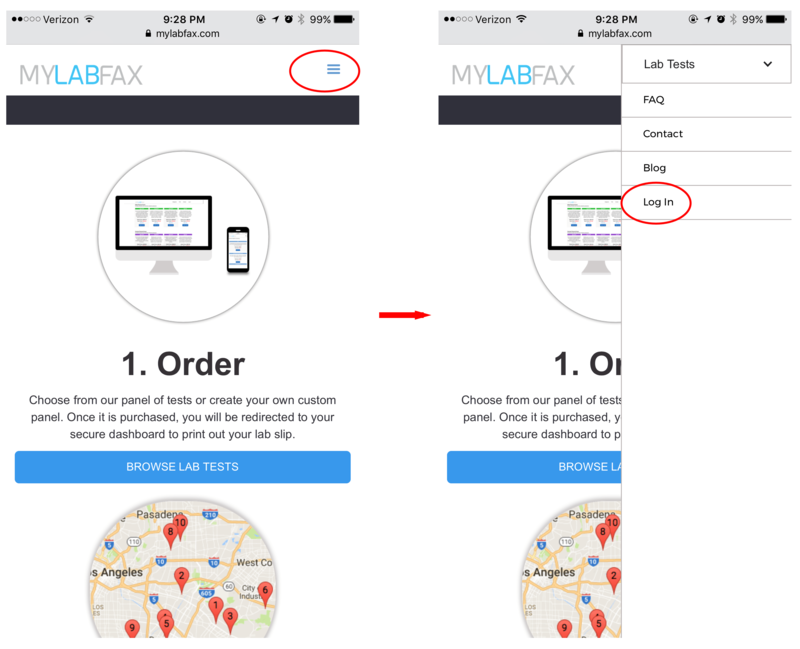 To print your lab, select “View/Print Lab” and a new page will open up with your PDF. An example of what your lab slip would look like. And with that, you’re all set to go! Visit your nearest Quest Laboratory, lab slip in hand, and they’ll take care of the rest. Depending on what tests you ordered, they can take anywhere from 1-5 business days. For example, I’ve ordered a Testosterone test and it took a week. However, when I ordered a Complete Blood Count (CBC), my results were ready the next day. An email will be sent out to you when your results are ready. Click the “Log In” button to be taken to the dashboard page. Click Log In to be taken to your dashboard. Mobile users will see this layout. If your results are ready, you should see a second button next to “View/Print Lab” that says “Results”. Clicking this will open a second page with your results. The test names in bold are the major tests you ordered (CBC in this example). What follows below in lighter font are the various markers that it tests for. 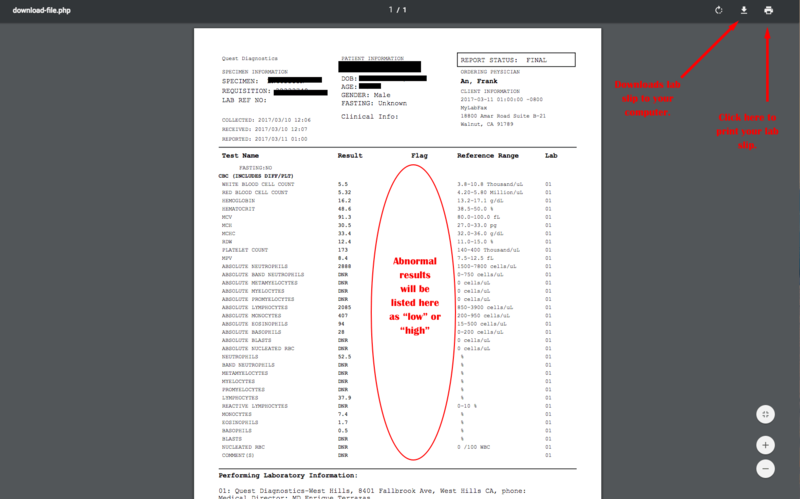 The results column shows your blood test's values or results. Skipping over to the fourth column, the Reference Range is the range in which your blood test results should fall (3.8-10.8 in the white blood cell count example). If your results fall anywhere outside these values, it will be “flagged” in the third column as either “high” or “low”. If your results are flagged, it doesn't necessarily mean something is wrong —These results are merely a “snapshot” of how your body was at the moment of your blood test. People who forgot to fast, or were hungover from drinking, or didn’t sleep well the night before could end up with wildly different results than they would have otherwise. This is why, if you know you're getting your blood drawn, it's critical to prepare your body accordingly. It’s important that you share any results you’re concerned about with your physician, as s/he will have the final word on your current state of health. Remember, if at any time you have any questions, please do not hesitate to send us a message by clicking the “Contact” tab at the top of our homepage. It is very likely that for each question we receive, there are 20 other people wondering the same thing. By reaching out to us, you will be helping us to better understand what our customer’s needs are.